Auszeit Garni Hotel Hamburg offers comfortable rooms just 20 km from Hamburg city centre. Free Wi-Fi internet access is available throughout the hotel and free parking is provided. All rooms at Auszeit Garni Hotel Hamburg are designed in classic style with a flat-screen TV. 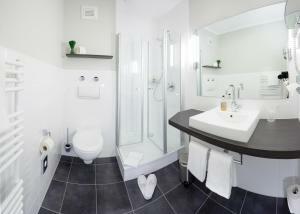 They each feature an en suite bathroom with a hairdryer and complimentary toiletries. Fischbeker Heide Nature Reserve is just 2 km from the hotel. The Altes Land marshland is 5 km away, and is regarded as central Europe's largest fruit-growing region. Mountain bikers will also find Harburger Berge 5 km from Auszeit. Within a 5-minute walk of the hotel, there are several restaurants specialising in German, Greek and Balkan cuisine. Auszeit Garni Hotel Hamburg is just 400 metres from Hamburg Neugraben S-Bahn Station, which will take you to the harbour and Reeperbahn within 30 minutes. It is a 10-minute drive to the A1 motorway. Please note the reception opening hours: Mondays to Fridays: 07:00 - 21:00 Saturdays and public holidays: 08:00 - 18:00 Sundays: 08:00 - 16:00. If you arrive outside opening times, you must contact the hotel in advance to get the code for the key safe. Guests are required to show a photo identification and credit card upon check-in. Please note that all Special Requests are subject to availability and additional charges may apply.